Living in the cold, wet northern hemisphere is not for everyone, and even those who enjoy the chilly temperatures and snowfall need to take a break in a warmer climate from time to time. Taking a vacation, however, especially for those with large families and individuals who work full time, isn’t always an option. Travelling expenses, along with planning a week’s worth of activities, and trying to accommodate everyone can sometimes be more of a headache than a vacation. A vacation-like ambiance can be made right at home, and doing so is a breeze with the help of a greenhouse and an expert team of designers. Greenhouses are made almost entirely of glass windows and skylights, which allows the sun to warm the interior, making a tropical climate for both humans and plants. Overheating and sunburn will not be an issue, as long as proper glazing options are considered. Incorporating low emission glass coatings, such as LoE 366, will produce a highly efficient glass structure that will block harmful rays in the summer and insulate during the winter. Ventilation will be crucial to ensure air circulates and does not become stagnant. Ridge vents, eave vents, and operable windows are great ventilation options for both humans and plants. Incorporating a retractable roof skylight will open the structure to the outside on warm, sunny days. Growing palm trees inside the greenhouse is an ideal way to create a vacation atmosphere, as are hibiscus, and practically any vibrant tropical flower. Before cultivation begins, however, it is important to research the various preferences of each plant in order to ensure the greenhouse growing environment is mutually beneficial for each different species. Once the vegetation has been selected, creating the perfect interior environment will be easy with the help of a greenhouse control system, which integrates all lighting, heating, cooling, and irrigation accessories into one cohesive unit. Adding a full-sized pool, spa, or other water features will elevate the tropical greenhouse oasis and help produce the total vacation package. 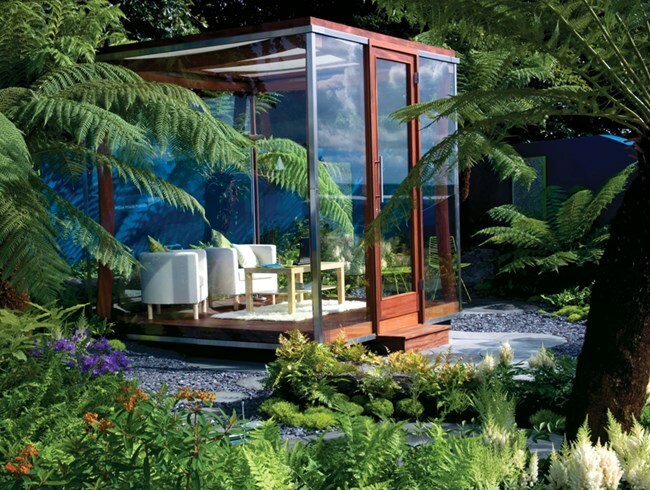 Incorporating a water feature inside a greenhouse or other glass structure, though, will most likely increase interior humidity and condensation, especially in a high-performing structure. Condensation has the ability to promote fungal growth in the atmosphere, which can negatively affect both people and plants. Ensuring proper structural ventilation with ridge vents, eave vents, operable windows, and skylights will help minimize and monitor condensation levels and create a comfortable experience for all users. Greenhouses, whether designed as a freestanding structure or attached to an existing building, are the perfect way to create a tropical vacation spot right at home. Doing this will allow users a relaxing getaway at any time of year and also reduce yearly vacation costs in the long run.